Save yourself mega-bucks by using a ceiling fan during these hot summer days and nights. To learn more about the ALA Lighting Makeover Contest, or to enter in person, visit a Hortons Home Lighting showroom near you. No. Believe it or not, what’s more important is selecting a ceiling fan that is the right size for the space. Rooms that are approximately 150 square feet or larger require a 52-inch diameter fan to be most effective. Smaller rooms can use either a 42-inch or 48-inch diameter model. Larger great rooms may require bigger fans with up to a 72-inch span. Most ceiling fans sold have five blades, but this is more of an aesthetic consideration rather than a practical one. A fan with fewer blades actually moves more air. That is why fans located high in a space, such as a warehouse, will typically be industrial-grade, three-blade fans. Unless a home has extremely high ceilings and the objective is to move a significant amount of air, it is generally acceptable to buy a fan with four or five blades. Do you have lighting or ceiling fan questions? To get all the answers to your lighting and ceiling fan questions, visit a Hortons Home Lighting showroom. A ceiling fan can make a room feel 10 degrees cooler. It runs on a fairly low amount of energy that is equivalent to a 100-watt bulb – and even less if it is an Energy Star®-qualified fan. 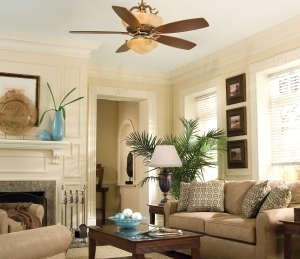 The best place to install a ceiling fan is any room where you will be spending a lot of time. There really is not an area in the house where people are not installing ceiling fans, including the family room, bedroom, recreation room, bathroom and garage. With outdoor spaces gaining popularity, many people are also installing ceiling fans in covered porch areas. Deciding where to install a ceiling fan is just the first step. Today, a wide variety of ceiling fan sizes, styles and types makes choosing one an important part of room décor. One of the biggest advantages of buying a ceiling fan from an American Lighting Association-member showroom is that they have expert sales associates to help with the selection process. For expert advice on choosing the right ceiling fan for your space, visit a Hortons Home Lighting showroom.